↑ Music Blog, The L.A. Times (20 May 2012). 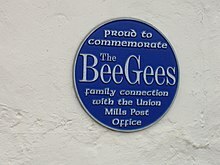 "Robin Gibb dead: Bee Gees singer, 62, had battled cancer". Los Angeles Times. Retrieved 22 February 2013. 1 2 3 4 Hughes, Andrew. The Bee Gees - Tales of the Brothers Gibb. Retrieved 29 January 2013. ↑ Songfacts.com. "Time Is Passing By by Bee Gees". Retrieved 17 February 2015. ↑ Marion Adriaensen. 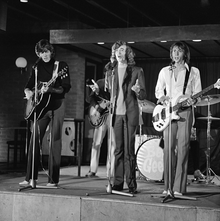 "History Part 3 - The Story of the Bee Gees: 1960–1965". Retrieved 26 January 2015. ↑ Graff, Gary (20 May 2012). "Robin Gibb of the Bee Gees Dead at 62". Billboard. Retrieved 19 February 2015. ↑ Margaret Moser, Bill Crawford. Rock Stars Do The Dumbest Things. Retrieved 19 February 2015. ↑ Goldstein, Richard (20 July 1967). "The Children of Rock; Belt the Blues". Billboard. Retrieved 24 January 2015. ↑ Henry Scott-Irvine. Procol Harum: The Ghosts Of A Whiter Shade of Pale. Retrieved 19 February 2015. 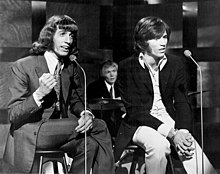 ↑ "Obituary: Robin Gibb". 21 May 2012. Retrieved 7 February 2019 – via www.bbc.com. ↑ Brennan, Joseph. "Gibb Songs: 1969". Retrieved 17 February 2015. ↑ Brennan, Joseph. "Gibb Songs: 1969". Retrieved 30 November 2014. ↑ "Bee Gees Chuck Berry Johnny B Goode (Live At Midnight Special 73).mpg". YouTube. Retrieved 15 February 2015. ↑ "Reelin' and Rockin' - Chuck Berry The Midnight Special 1973". YouTube. Retrieved 15 February 2015. ↑ Brennan, Joseph. "Gibb Songs: 1974". Retrieved 5 December 2014. ↑ David N. Meyer. The Bee Gees: The Biography. Retrieved 5 December 2014. ↑ Brennan, Joseph. "Gibb Songs: 1975". Retrieved 1 December 2014. ↑ Brennan, Joseph. "Gibb Songs: 1977". Retrieved 1 December 2014. ↑ Brennan, Joseph. "Gibb Songs: 1976". Retrieved 1 December 2014. ↑ Johnson Publishing Company. Jet. Johnson Publishing Company; 2 May 1988. p. 54. ↑ Brennan, Joseph. "Gibb Songs: 1980". Retrieved 1 December 2014. ↑ Brennan, Joseph. "Gibb Songs: 1983". Retrieved 1 December 2014. ↑ Brennan, Joseph. "Gibb Songs: 1984". Retrieved 1 December 2014. ↑ Lister, David (28 May 1994). "Pop ballads bite back in lyrical fashion: David Lister charts a sea change away from rap towards memorable melodies". The Independent. Retrieved 15 July 2014. ↑ Singh, Anita (20 November 2011). "Robin Gibb diagnosed with liver cancer". The Sunday Telegraph. London. Retrieved 20 November 2011. ↑ Brennan, Joseph. "Gibb Songs: 2014". Retrieved 17 February 2015. ↑ Hughes, Andrew. The Bee Gees – Tales of the Brothers Gibb. Retrieved 29 January 2013. ↑ "Community News ... Who, What & Where". Ocala Star-Banner. 16 May 1978. pp. 1B. Retrieved 5 May 2012. ↑ O'Connor, Roisin (27 June 2018). 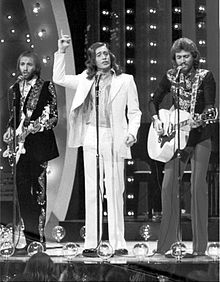 "Sir Barry Gibb knighted at Buckingham Palace by Prince Charles: 'If it were not for my brothers, I would not be here'". The Independent. Retrieved 28 June 2018. ↑ "Bee Gees Head Lists For 6 Grammy Awards". Daytona Beach Morning Journal. The News-Journal Corporation. 9 January 1979. Retrieved 19 February 2015. ↑ "World Music Awards :: Awards". Retrieved 6 April 2014.